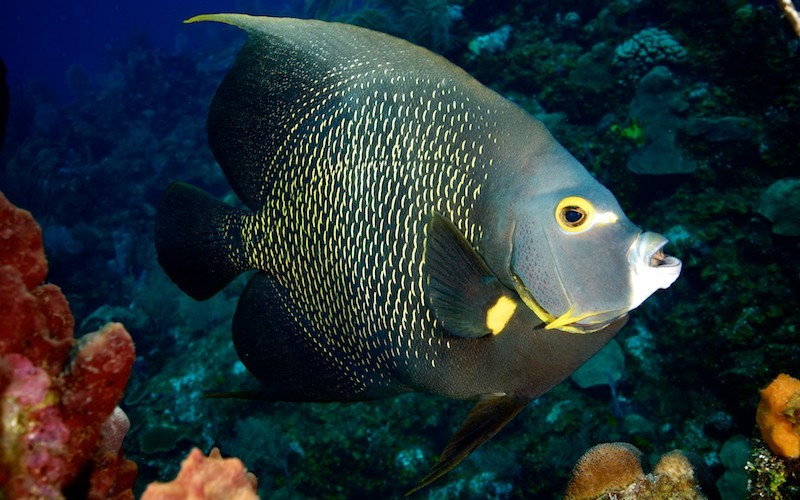 Caption: The French Angelfish, Pomacanthus paru, is a large angelfish of the family Pomacanthidae, found in the western Atlantic from Florida and the Bahamas to Brazil, and also the Gulf of Mexico and the Caribbean, including the Antilles, and the eastern Atlantic from around Ascension Island and St. Paul's Rocks, at depths of between 2 and 100 m. Length is up to 41 cm. The French angelfish is common in shallow reefs, occurs usually in pairs often near sea fans. It feeds on sponges, algae, bryozoans, zoantharians, gorgonians and tunicates. Juveniles tend cleaning stations where they service a broad range of clients, including jacks, snappers, morays, grunts, surgeonfishes, and wrasses. At the station the cleaner displays a fluttering swimming and when cleaning it touches the clients with its pelvic fins. The adult background coloration is black but the scales of the body, except those at the front from nape to abdomen, are rimmed with golden yellow. Furthermore the pectoral fins have a broad orange-yellow bar, the dorsal filament is yellow, the chin is whitish, the outer part of the iris is yellow, and the eye is narrowly rimmed below with blue. Juveniles are black with vertical yellow bands.